Do you know how the empires were built? It always starts with an idea to scale something small. So, right now you have a unique opportunity not only to monetize your website but to increase your income greatly by spreading the word at the right place. Just place your personal link anywhere on the internet and get 5% from all earnings your followers will get after registration in AdNow. The best part is that it’s not a temporary income. You will surely get your percentage as long as your publisher works with AdNow. First, get your personal referral link in the dashboard or sign up with AdNow if you haven’t done it yet. Then place this link alongside a piece of relevant content so people’d understand why they should click on it. There’re many ways to spread the word and make your link viral. Let’s look at the most common ones. Social Media is the most effective way to reach large audience in a short period of time. You can write a review, share your experience of working with the network or just tweet a few words to interest people. You can write an article with some good points on how to monetize the website effectively for example. Or just place a promotional banner along with your personal link. Make a screencast on usability or a viral video so a lot of people could see it and follow the link. YouTube videos are the easiest way to get a lot of followers and increase your income greatly through AdNow referral program. There’re thousands of places where you can add your referral link on the internet. That could be comments to the related articles, forums, email letters, social media groups. So, that depends only on your imagination how to make this program even more profitable. And don’t forget that the wider your audience reach, the more you earn. 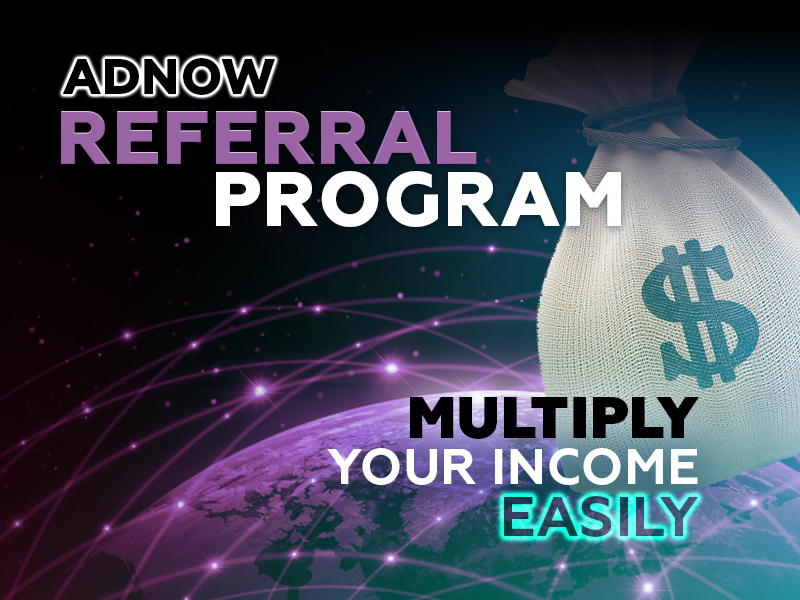 AdNow referral program provides benefits for all the participants of the partnership. So, join now and let your referral network work for you.